Sea surface temperatures in the east-central tropical Pacific Ocean remain at weak La Niña levels, while most atmospheric indicators are now consistent with an imminent decay of the La Niña event. Most climate models indicate that a transition from La Niña to ENSO-neutral conditions is likely early in the second quarter of 2018, while a continuation of La Niña conditions through the second quarter is less likely. Although a possibility for warming conditions is suggested by some models for the second half of 2018, such long-lead forecasts of the ENSO conditions are uncertain because forecasts going through the March-June period are known to have lower confidence than those made at other times of the year. National Meteorological and Hydrological Services will continue to closely monitor changes in the state of ENSO over the coming months. Since early November 2017, sea surface temperatures across much of the east-central tropical Pacific have been at weak to moderate La Niña levels, with monthly average temperatures of 0.5 to 1.1 degrees Celsius below average for the 1981-2010 period. Up until February 2018, the key atmospheric indicators also showed La Niña patterns, including enhanced precipitation over the far western Pacific and an area of reduced rainfall near and east of the International Dateline. Additionally, enhanced trade winds were observed mainly in the western tropical Pacific, and sea level pressures were higher than normal in the eastern Pacific and lower than normal in the west. Beginning in February, however, many of the atmospheric indicators of La Niña returned to an ENSO-neutral condition. For example, the enhanced low-level trade winds that were observed from November through January returned to a more average strength, and the pattern of enhanced precipitation over the Maritime Continent and the suppressed precipitation near and east of the International Dateline largely disappeared. The decay of La Niña-like atmospheric patterns was due partly to strong intra-seasonal activity during February, but also to the weakening of the La Niña event. The temperature of the waters at depth, from the central Pacific eastward and extending several hundred meters below the surface, were moderately below average from September 2017 through early January 2018, but returned to near-average in late January as above-average waters in the western part of the basin pushed eastward to well east of the International Dateline. The waters at depth often provide an indication of the coming ENSO conditions at the surface, and together with the recent return of many atmospheric indices to neutral levels, suggest that the sea surface temperatures, now still reflecting La Niña, may be decaying to neutral during March and into April. Most models surveyed predict that sea surface temperatures in the east-central tropical Pacific Ocean will return to neutral (between 0.5 degrees Celsius below average and 0.5 degrees above average) within the coming two months (March or April). A small number of models predict a continuation of La Niña conditions through the second quarter of 2018. For the second half of 2018, many models predict neutral ENSO conditions, while some predict a warming to weak El Niño levels beginning in the third or fourth quarter. However, uncertainty about the ENSO condition beyond the second quarter is significant, as forecasts whose lead time passes through the March-June period are known to have relatively lower confidence than forecasts not traversing that difficult period. Based on the model predictions and expert assessment, the chance of a return to neutral conditions by the end of the second quarter of 2018 is about 75-80%, while the chance of La Niña continuing into the third quarter is about 20-25%. During the second half of the year, while the probability for the development of El Niño is slightly greater than climatological probability, continuation of neutral conditions is considered to be the most likely scenario into late 2018. It is important to note that El Niño and La Niña are not the only factors that drive global climate patterns, and that the strength of ENSO does not automatically correspond to the strength of its effects. At the regional level, seasonal outlooks need to assess the relative effects of both the El Niño/Southern Oscillation state and other locally relevant climate drivers. For example, sea surface temperatures of the Indian Ocean, the southeastern Pacific Ocean and the Tropical Atlantic Ocean are also known to influence the climate in the adjacent land areas. Regionally and locally applicable information is available via regional and national seasonal climate outlooks, such as those produced by WMO Regional Climate Centres, Regional Climate Outlook Forums and National Meteorological and Hydrological Services. 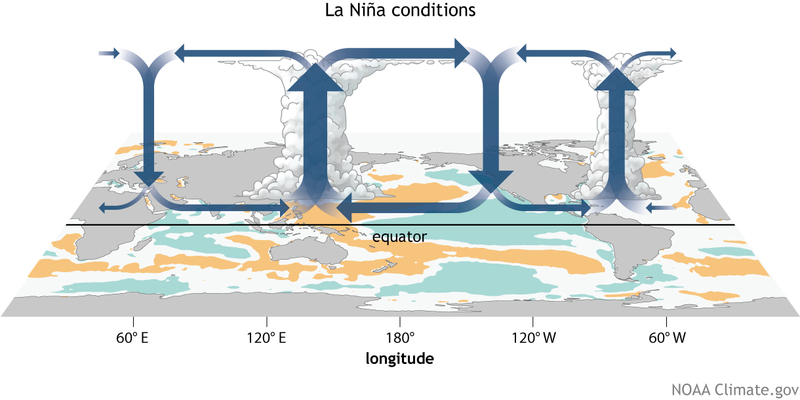 La Niña conditions that developed in late 2017 have continued into the first quarter of 2018, although during February many key atmospheric patterns have weakened to neutral levels and the sub-surface sea temperature has also returned to neutral; Model predictions and expert opinion indicate that La Niña conditions are 75-80% likely to return to neutral during the second quarter of 2018; For the second half of 2018, some models predict the development of a weak El Niño, but considering that the predicted probabilities of El Niño are only marginally higher than climatological probability and that long-lead forecasts made at this time of the year are typically very uncertain, continuation of neutral conditions is a more likely scenario. The state of ENSO will continue to be carefully monitored. More detailed interpretations of regional climate variability will be generated routinely by the climate forecasting community over the coming months and will be made available through National Meteorological and Hydrological Services. The WMO El Niño/La Niña Update is prepared through a collaborative effort between the WMO and the International Research Institute for Climate and Society (IRI), USA, and is based on contributions from experts worldwide, inter alia, of the following institutions: African Centre of Meteorological Applications for Development (ACMAD), Armenian State Hydrometeorological and Monitoring Service (ARMSTATEHYDROMET), Asia-Pacific Economic Cooperation (APEC) Climate Centre (APCC), Australian Bureau of Meteorology (BoM), Australian Centre for Sustainable Catchments of the University of Southern Queensland, Badan Meteorologi Klimatologi dan Geofisika (BMKG) – the Meteorological, Climatological and Geophysical Agency of Indonesia, Centro Internacional para la Investigación del Fenómeno El Niño (CIIFEN), China Meteorological Administration (CMA), Climate Prediction Center (CPC) and Pacific ENSO Applications Centre (PEAC) of the National Oceanic and Atmospheric Administration (NOAA) of the United States of America (USA), Climate Variability and Predictability (CLIVAR) project of the World Climate Research Programme (WCRP), Comisión Permanente del Pacífico Sur (CPPS), El Comité Multisectorial Encargado del Estudio Nacional del Fenómeno El Niño (ENFEN) of Peru, European Centre for Medium Range Weather Forecasts (ECMWF), Météo-France, Fiji Meteorological Service, IGAD (Inter-Governmental Authority on Development) Climate Prediction and Applications Centre (ICPAC), Instituto Nacional de Meteorología e Hidrología (INAMHI) of Ecuador, the IRI, Japan Meteorological Agency (JMA), Korea Meteorological Administration (KMA), Mauritius Meteorological Services (MMS), Met Office in the United Kingdom (UKMO), National Center for Atmospheric Research (NCAR) of the USA, Southern African Development Community Climate Services Centre (SADC-CSC), Tasmanian Institute of Agriculture, Australia, and the University of Colorado, USA. Research conducted over recent decades has shed considerable light on the important role played by interactions between the atmosphere and ocean in the tropical belt of the Pacific Ocean in altering global weather and climate patterns. During El Niño events, for example, sea temperatures at the surface in the central and eastern tropical Pacific Ocean become substantially warmer than normal. In contrast, during La Niña events, the sea surface temperatures in these regions become colder than normal. These temperature changes are strongly linked to major climate fluctuations around the globe and, once initiated such events can last for 12 months or more. The strong El Niño event of 1997-1998 was followed by a prolonged La Niña phase that extended from mid-1998 to early 2001. El Niño/La Niña events change the likelihood of particular climate patterns around the globe, but the outcomes of each event are never exactly the same. Furthermore, while there is generally a relationship between the global impacts of an El Niño/La Niña event and its intensity, there is always potential for an event to generate serious impacts in some regions irrespective of its intensity.